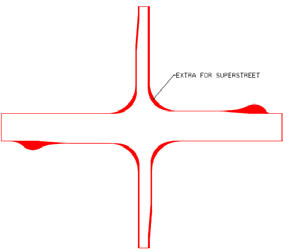 RCUT intersections, also referred to as super street intersections, are a promising solution for arterials with more dominant flows on the major road. They have the potential to move more vehicles efficiently and safely than roadways with comparable traffic volumes that have conventional at-grade intersections with minimal disruptions to adjacent development. The RCUT intersection works by redirecting left-turn and through movements from the side street approaches. Instead of allowing those movements to be made directly through the intersection, as in a conventional design, a RCUT intersection accommodates those movements by requiring drivers to turn right onto the main road and then make a U-turn maneuver at a one-way median opening 400 to 1,000 ft downstream. 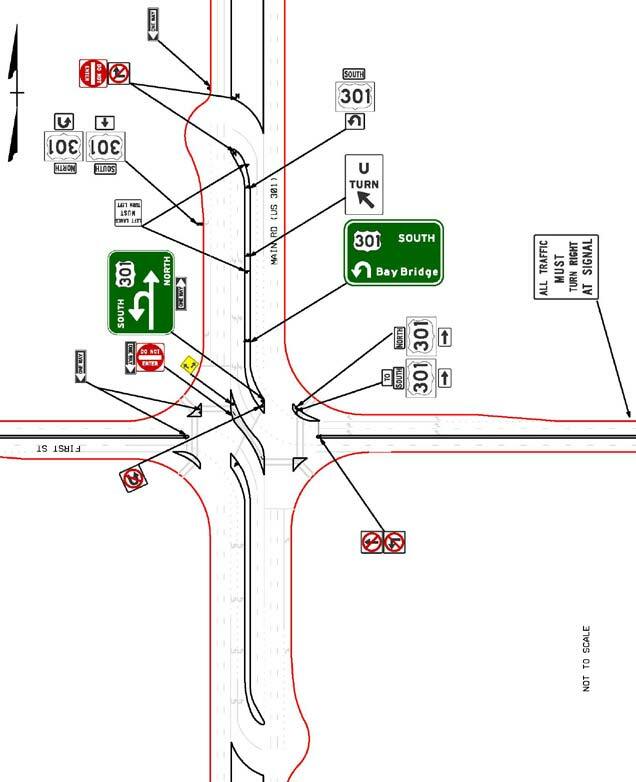 Figure 82 shows a RCUT intersection at West Big Beaver Road and Lakeview Drive in Troy, MI. Figure 82. Photo. RCUT intersection in Troy, MI. 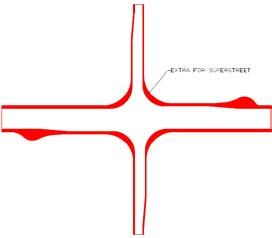 Figure 83 shows a conceptual diagram of a RCUT intersection. The RCUT intersection configuration shown is generally suited to higher volume major roads in suburban and rural areas, especially at intersections with relatively low through traffic volumes entering from the side road. At the type of intersection shown in figure 83, left turns from the main road are similar to conventional intersections. Specifically, left turns are made from left-turn lanes on the main road directly onto the side road. For this type of RCUT intersection design, pedestrians cross the main street in a diagonal fashion, going from one corner to the opposite corner. Figure 83. Illustration. Conceptual RCUT intersection configuration with direct left turns from the major road. Figure 84 shows a more rudimentary type of RCUT intersection that is more frequently used at low-volume and rural locations. In the configuration shown in figure 84, drivers wanting to turn left from the main road to the side street make a U-turn maneuver at the median crossover and then turn right onto the side street. This maneuver is similar to the indirect left turn executed at MUT intersections discussed in chapter 3. The left turns and through movements from the minor street are again routed through the U-turn crossovers. This basic configuration shown in figure 84 can be implemented without any signal control. Figure 84. Illustration. Basic RCUT intersection with no direct left turns. Traffic engineer Richard Kramer first published the RCUT concept in the early 1980s. (53) Kramer’s notion was that arterials, as important routes serving large volumes of through traffic, should have a high percentage of green time at signal-controlled intersections to promote high-quality progression. His RCUT design met those objectives by functioning like a pair of one-way streets separated by only a narrow median. RCUT intersections have been constructed in several locations in the United States, including the location in Michigan shown in figure 82. For this report, MDSHA and NCDOT provided information on their RCUT intersections. 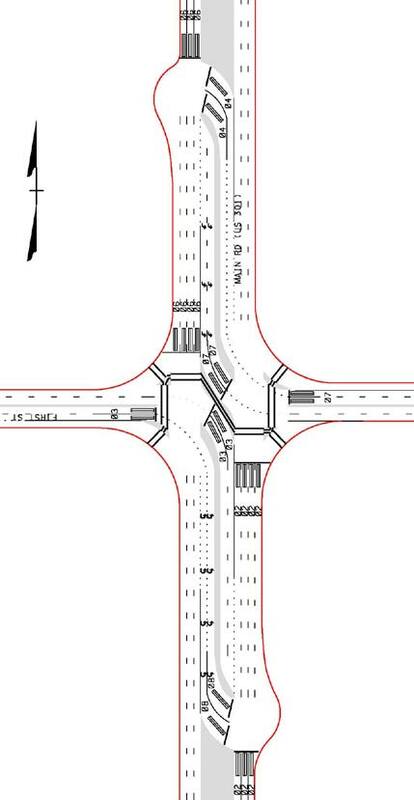 These RCUT intersections are the focus of examples discussed in this report. Three rural RCUT intersections have been in existence on U.S. Route 301 on Maryland’s Eastern Shore for years. In fact, Maryland has referred to its version of this treatment as a J-turn. A J-turn intersection is a variant of the RCUT intersection in that both the main intersection and the two crossovers are unsignalized. A J-turn looks like the concept shown in figure 83, but there is no signal control. Two J-turn intersections are shown in figure 85 and figure 86. A crossover is provided north of the northern J-turn intersection (U.S. Route 301 and Del Rhodes Avenue). The southern J-turn intersection (U.S. Route 301 with Main Street) also serves as the crossover for the vehicles that need to turn around. Another crossover is not provided south of the southern intersection shown in figure 85. 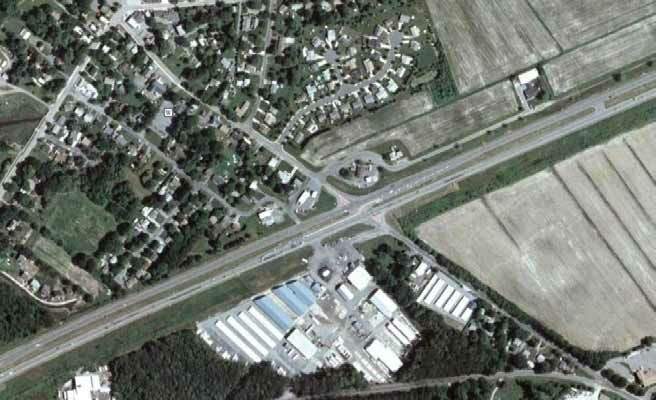 Figure 86 gives a closer look at the intersection of U.S. Route 301 and Del Rhodes Avenue and the northern crossover. The offset of the MUT crossover is located about 1,400 ft from the main intersection. Figure 85. Photo. U.S. Route 301 J-turn intersections in Maryland. Figure 86. Photo. U.S. Route 301 J-turn intersection with Del Rhodes Avenue in Maryland. 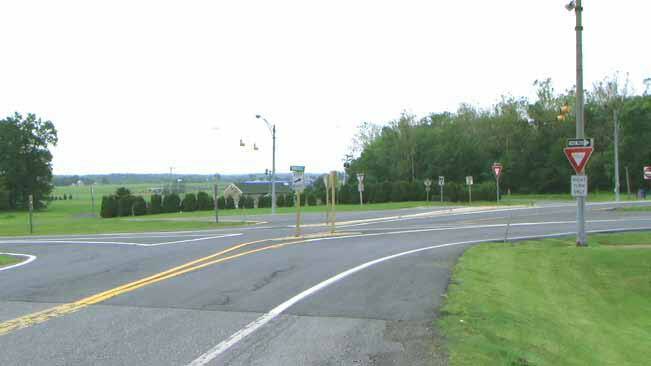 J-turn intersections have been constructed at the intersections of U.S. Route 15 and College Avenue/Annandale Road and U.S. Route 15 and South Seton Avenue in Emmitsburg, MD. 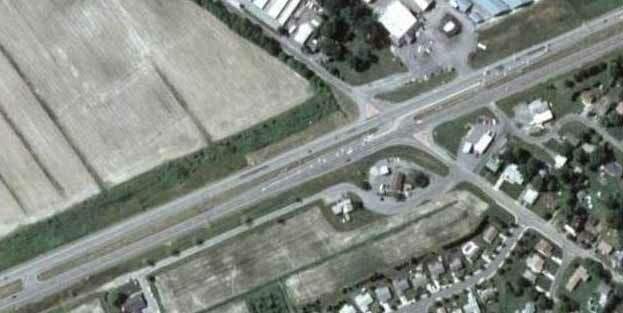 An aerial photograph of the intersection with Annandale Road is shown in figure 87. In addition, the intersection of U.S. Route 15 with Hayward Road in Frederick, MD, is a J-turn implementation on a T-intersection, with one set of U-turn crossovers built on the mainline for the left-turn movement from the minor road approach. 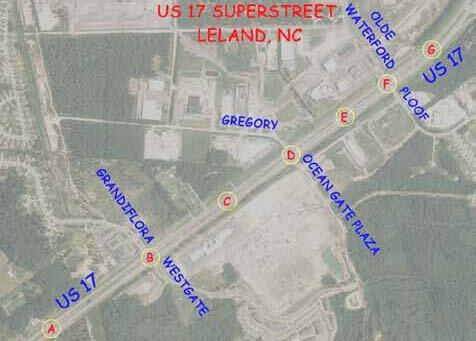 Offsets of the MUT crossover from the main intersection vary from about 2,000 to 2,500 ft.
NCDOT recently adopted the RCUT intersection design as an option for its higher classes of arterials in its Strategic Highway Corridors Plan. (54) At the time of this report, there are three RCUT intersections completed on segments of NCDOT highways. All three are on divided four-lane roads. Two are completed in rural areas, while the third, in a suburban area, serves a large development. The rural locations are U.S. Route 23/74 in Haywood County in the mountainous western part of North Carolina, and U.S. Route 1 in Lee and Moore Counties in the rolling central part of North Carolina. The rural RCUT intersections are both unsignalized. This segment of U.S. Route 23/74 is about 2.5 mi long and includes three sets of crossovers. This segment was implemented in 2000 as a retrofit of an existing conventional arterial. The segment of U.S. Route 1 includes five sets of crossovers spread over a 12-mi length of arterial. This section was opened on new alignment early in 2006. Figure 87. Photo. U.S. Route 15 RCUT intersection in Emmitsburg, MD. The suburban location is U.S. Route 17 in Brunswick County, just southwest of Wilmington, NC, in the flat terrain near the Atlantic Ocean. Figure 88 shows the corridor with the RCUT intersection and crossovers on U.S. Route 17. It includes three sets of signalized crossovers over a segment less than 1-mi long. Construction was completed in mid 2006. The large retail development located at the U.S. Route 17 RCUT intersection opened in early 2007, and the development in the immediate area continues to increase. Figure 88. Photo. 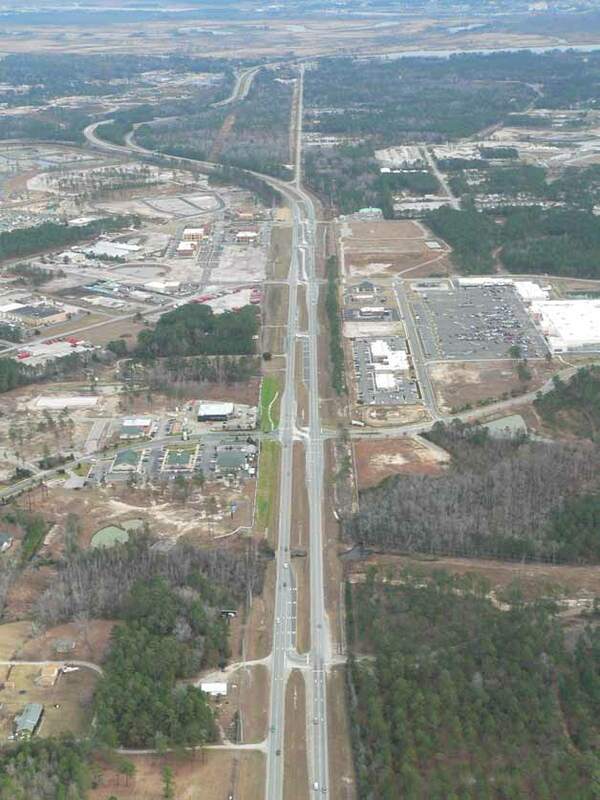 U.S. Route 17 RCUT intersection corridor in Brunswick County, NC. Safety benefits are anticipated from implementing RCUT intersections at appropriate locations. This is attributable to reduced vehicle-vehicle conflict points, as discussed later in this chapter. Crashes occurring at the conflict points at RCUT intersections are expected to be less severe than at conflict points at conventional intersections. Section 4.7 discusses safety issues at RCUT intersections in more detail. When traffic signal control is needed at a RCUT intersection, it requires only two signal phases instead of the typical four or more phases that are used at a conventional four-legged intersection. Reducing the number of signal phases translates to significant time savings for all roadway users. Travel time savings consequently leads to reduced emissions and fuel consumption, increased productivity, and improved quality of life. Another traffic operational benefit provided by a RCUT intersection is improving the progression of traffic platoons on the arterial. With a RCUT intersection, the signals that control one direction of the arterial operate independently of signals controlling the other direction. Kramer intended that a main road can operate like a pair of one-way streets and that good progression in both directions was possible at any speed with any signal spacing. (53) Conventional arterials cannot approach this efficiency without extensive control of access and signal installations. With RCUT intersections, agencies can set progression speeds as high or low as they wish (e.g., by location, direction, time, day of week, or any number of ways) without adversely increasing delay. In addition, RCUT intersections more easily accommodate the installation of new traffic signals without a significantly adverse impact on the quality of progression. However, the addition of traffic signals at the median crossovers may limit progression, depending on the volume of vehicles using the crossover. There are several variations of the RCUT intersection design that each requires different pedestrian paths, with some being more similar to conventional intersection pedestrian paths than others. Longer paths across streets lead to increased delay or inconvenience for pedestrians and increased exposure to traffic. The nontraditional vehicle movements are counterintuitive to pedestrians with visual disabilities. However, there are potential designs and treatments that can mitigate these concerns. Therefore, installation of a RCUT intersection needs to balance pedestrian and vehicle safety and operational concerns. For example, barriers can be used to channelize pedestrians along the proper path, but the barriers would be fixed objects that could pose a hazard to motorists. A subsequent section of this chapter provides more information about accommodating pedestrians. Though pedestrians may not be expected at the intersection immediately, if development is expected to continue in the area, the RCUT intersection design should account for future increases in pedestrian traffic. A RCUT intersection has some disadvantages for certain conditions, notably at intersections where there are heavy through and left-turn volumes from the side street approaches. Under certain volumes, the RCUT intersection becomes less efficient than a conventional intersection. At some volume levels, side street through and left-turn volumes become so heavy that the extra travel time incurred by these drivers at a RCUT intersection outweighs the time savings to drivers on the main street. As with any new design, driver confusion is a concern. However, the experiences with RCUT intersections in North Carolina and at J-turn intersections in Maryland indicate that drivers adapt well to RCUT intersections. Another disadvantage of the RCUT intersection is the combined median and lane width needed to accommodate large vehicles making U-turns at crossovers. It is not uncommon for a large truck to have a turning radius of up to 45 ft. (7) Ideally, medians would be 42 to 66 ft wide to accommodate those vehicles making U-turns in the median, though a combination of median, lane, and shoulder width could be designed to accommodate trucks with a more narrow median. A subsequent section in this chapter addresses several treatments that enable RCUT intersections to be viable when the median width is less than the desirable width. Like many designs that feature wide medians, RCUT intersections can be perceived to adversely affect roadside businesses, particularly businesses not at median openings that attract left-turn pass-by trips. (12) This potential negative impact should be studied to determine the possible magnitude and to evaluate any mitigation measures, as this could be a significant issue to render this design unfeasible due to real or perceived impact. The key difference between an MUT intersection (discussed in chapter 3) and a RCUT intersection is that an MUT intersection allows through movements from the side street. A RCUT intersection has either no median openings at the intersection or has one-way directional median openings to accommodate traffic making left turns from the main street onto the side street. Figure 89 through figure 91 show designs for typical four-legged RCUT intersections. This design is for the more complex version which is more suitable for arterials with higher volumes. Should pedestrians be expected at intersections, these designs need to be modified to better accommodate them. For example, if right-turn lanes and/or channelizing islands are eliminated and the tightest turn radii are used, pedestrian crossing distances are shorter. The first method of reducing right-of-way needs is to provide some median openings that only accommodate smaller vehicles. Proper highway signs need to be placed in appropriate locations to prohibit trucks at these crossovers. A second method of reducing the amount of needed right-of-way is to allow vehicles to turn onto a shoulder, which has been strengthened with full-depth pavement. A third way to reduce right-of-way is to provide bulb-outs or loons at the U-turn crossovers. A loon is an expanded paved apron opposite a median crossover. The purpose is to provide additional space to facilitate the larger turning path of a commercial vehicle along narrow medians. (33) Chapter 3 provided discussion on loon design. A fourth method to reduce right-of-way width throughout a RCUT intersection corridor is to use reverse curves on the main street through roadways to widen the median for a short distance at a crossover and then narrow it back down beyond the crossover. Drivers may not initially expect these alignment changes but could quickly adapt to the design. Using any of these methods means that medians do not have to be wider than 16 ft, which accommodates a minimum 4-ft-wide median and a 12-ft-wide turn bay along much of the length of a RCUT intersection design. For these cases, the overall right-of-way required for a corridor of RCUT intersections can be as narrow as 84 ft for four-lane arterials and as wide as 132 ft for eight-lane arterials. Figure 89. Illustration. Example of a RCUT intersection in which the side street has two approach lanes. Figure 90. Illustration. Example of a RCUT intersection in which the side street has one approach lane. Figure 91. Illustration. Example of a RCUT intersection with dual left-turn lanes on the major road that are back-to-back with dual turn lanes for the U-turn crossover. Figure 92. Illustration. Three-legged RCUT intersection design. Figure 93. Illustration. Offset RCUT intersection design. As stated in chapter 3 on MUT intersections, designers have flexibility in selecting the crossover spacing. To accommodate constraints related to drainage, sight distances, or available right-ofway, crossovers are shifted toward or away from a main intersection with relatively minimal adverse effects on traffic operations. Locating a crossover so that vehicles can make U-turns or left turns into the driveway or side street is common practice at median crossovers in Michigan. This treatment can prove beneficial at RCUT intersections where the combination of main road turning volumes and driveway volumes do not have a significant impact on the major road through traffic (by turn queues blocking through lanes, for example). Designers may use one-lane or two-lane crossovers for U-turns depending on traffic volume demands and the number of receiving lanes. AASHTO’s Green Book and the MDOT Geometric Design Guide 670 provide U-turn crossover design details for MUTs that also apply to RCUT intersections. (7,37) Figure 94 shows a typical movement of a heavy vehicle in a loon, and figure 95 shows a photograph of a heavy vehicle maneuvering a U-turn in a loon. NCDOT recommends an outside turning radius of 100 ft for the major road left-turn crossover, as seen in figure 96. Figure 94. Illustration. Loon at crossover that features two U-turn lanes. Figure 95. Photo. U-turn movement of a heavy vehicle at a RCUT intersection with a loon on U.S. Route 17 in North Carolina. In the case of unsignalized U-turn crossovers, as in the J-turn treatments constructed in Maryland, auxiliary lanes are provided. These serve as acceleration lanes for the U-turn movements merging onto the mainline (refer to figure 97). In the Maryland treatment, the acceleration lane for U-turning drivers was constructed into the median and then continued to become the left-turn lane at the main intersection. Although this treatment involves extra paving and the disadvantage of inducing drivers into a trap lane, it works well at this intersection where sight distance is not an issue. Alternatively, the termination of the acceleration lane could be followed by the introduction of a left-turn lane upstream of the main intersection. Figure 97. Photo. Auxiliary lanes at J-turn at Emmitsburg, MD. 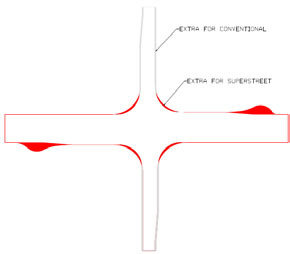 For an unsignalized RCUT intersection, the offset of the MUT crossover from the main intersection should be located according to AASHTO’s Green Book requirements for the selected design speed of the freeway. (7) Offset distance is based on acceleration, weaving, and deceleration lengths for the longest of either direction—from the main intersection to the U-turn or from the U-turn crossover to the main intersection. Minimum offset distance from the crossroad should include a minimum acceleration length plus the taper length, a certain weaving length for vehicles to move from the right to the left side of the freeway, and a minimum deceleration lane length (on the left side) that first includes the flare length. From the U-turn crossover, a minimum offset distance should include a minimum acceleration length (on the left side of the freeway) plus the taper length, a certain weaving length for vehicles to merge from the left to the right side (for the through turning vehicles), and a minimum deceleration lane length (on the right side) that first includes the flare length. As of yet, criteria for a minimum weaving length for this treatment does not exist. The weaving length depends on the combined maximum volumes of through volume and merging volumes from the crossroad. As a maximum, the combined volume of through plus merging volumes from the crossroad or the U-turn may not exceed 1,800 to 1,900 veh/h/lane (when lane utilization is assumed balanced). Furthermore, it would have to be verified with calibrated simulation models. 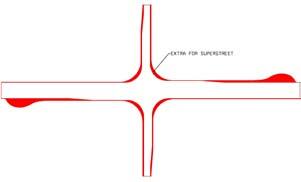 The primary intent of a RCUT intersection is to serve through traffic on the major road. RCUT intersections have the potential to provide a relatively high LOS to through motorists on the main street over a wide range of demands. No documented studies of the effects of RCUT intersections on adjacent land uses have been identified. Inferences about the effects of this intersection design on adjacent businesses can be drawn from the NCHRP Report 420, which indicates that some land uses suffer economic losses with wide median installation. (12) This is particularly true for businesses that rely on pass-by traffic, such as gas stations and convenience stores. The problems can be exacerbated when indirect left turns are needed to access some businesses. As stated in the NCHRP Report 420, during the planning of a project that involves creating or widening of a median, the perceptions of adverse business impacts are typically worse than the ensuing reality. (12) There is no net community-wide economic impact resulting from the access changes. Nonetheless, the possibility exists that RCUT intersection installations can create some business losses for some types of retail businesses. Designers can develop RCUT intersection designs that safely and efficiently manage access with minimum adverse impacts to adjacent land users. Designers have a great deal of flexibility in designing traffic signal control layouts at RCUT intersections depending on where existing driveways and access points are located. On a RCUT intersection corridor, an agency may install traffic signal control at any intersection on the arterial without significantly changing the progression potential. The signal offset for new traffic signal control at a crossover or at a right in/right out driveway can fit within the existing progression band on the arterial. Other factors such as signal visibility and queuing space need to be considered as well. There is flexibility in locating crossovers when designing RCUT intersections depending on the locations of existing access points. 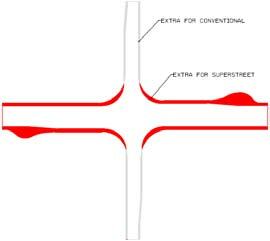 As noted previously, designers generally move a crossover without reducing the efficiency of the overall intersection operation. Moving a planned crossover location by several hundred feet so that it can also serve left turns into or out of a higher volume driveway or minor street may increase efficiency and safety of the whole corridor. Sight distance issues must be addressed when any crossover locations are considered. As with most high-type intersection designs, no driveways should be allowed in close proximity to the main intersection. Driveways are also undesirable on the opposite side of the arterial from a loon. If a driveway is placed across from a loon, then drivers may make wrong-way movements in the crossover. There are mixed results with respect to driveways and side streets lined up with the end of a U-turn crossover (e.g., in the loon). Such installations are common in the MUTs in Michigan and can lead to great efficiency. However, NCDOT is attempting to obtain full control of access along the arterial throughout the length of the loon on both sides of the road. 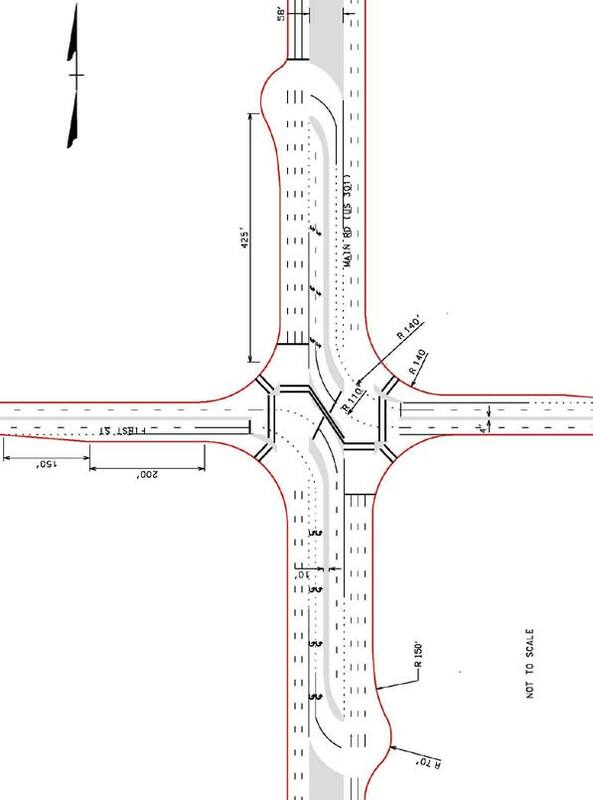 NCDOT has concerns about the possibility of conflicts between U-turning vehicles using the crossover and right-turning vehicles emerging from the driveway. For these reasons, NCDOT is endeavoring to not allow driveways or side roads that intersect the arterial in the loon. Figure 98. Illustration. Typical RCUT intersection signal locations. As can be seen in figure 98, signal controllers for one direction of the arterial can operate independently of the signal controllers for the opposite direction of the arterial. The only traffic stream moving through signals for opposite directions of travel on the arterial in a short distance is the pedestrian movement from signal 1 to signal 4 and from signal 4 to signal 1. Each direction of the arterial has its own cycle length. The independence of the two directions provides a much wider range of progression possibilities. Use a standard signal-timing method to determine the optimum cycle length at each signal. Select one common cycle length for each direction of the arterial, and readjust the green times at the individual signals accordingly. Establish the arterial progression speed. Determine signal offsets based on the distances between signal-controlled intersections and the progression speed (e.g., the end of the major street green phase at one signal-controlled intersection relative to the end of the major street green phase of the adjacent signal-controlled intersection). Adjust the offsets to allow for adequate start-up times to discharge standing queues and to provide progression possibilities for left-turning and U-turning traffic. 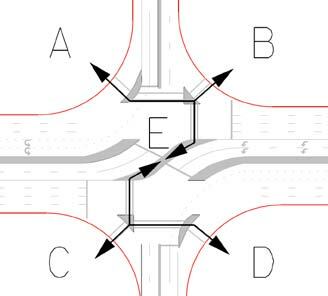 Because of their potential to achieve outstanding progression through a series of intersections, RCUT intersections should be considered as a corridor-wide treatment in addition to a treatment for a single intersection. Consequently, there can be one intersection on the corridor that allows left turns and/or through movements from the side street (i.e., a conventional intersection) without losing much of the progression potential. One conventional intersection on the corridor restricts the operation so that both directions of the main street of the RCUT intersection must have the same signal cycle length. However, the ability of a RCUT intersection corridor to accommodate one or more conventional intersections within the signal system increases the possible range of applicability of the design. When designing signals for a RCUT intersection, agencies must first determine where to install signals. There may be other locations along a RCUT intersection corridor where agencies might consider traffic signal control, including midblock pedestrian crossings. Signal warrants provided in the MUTCD provide key guidance on when and where signal control is justified. (8) Designers of RCUT intersections should realize that a corridor of these intersections can accommodate additional signal-controlled RCUT intersections locations within the major street progression band established by the surrounding signals. By contrast, additional traffic signal control on a conventional arterial is often devastating to two-way progression. Signal control at a RCUT intersection can be fully actuated to minimize delay. Detectors can be used in all of the crossovers, on the minor street approaches, and on the major street approaches. The duration of each signal phase can vary on a cycle-by-cycle basis. Different traffic signalization practices may affect the number of signal controllers provided at a RCUT intersection. Figure 98 illustrates four typical signal locations at a four-legged RCUT intersection. NCDOT has installed a separate signal controller at each of the four signal locations implemented on RCUT intersections thus far in North Carolina, thereby preserving the independence of the signal control on either side of the arterial. This practice may increase the implementation cost of RCUT installation and may prevent the signals from working together optimally in an actuated environment. Another potential is to develop a signal design for a RCUT intersection that features three controllers. One controls the signal displays at signals 1 and 4 (with locations as depicted in figure 98), and the other two control the signal displays at signals 2 and 3 (with locations as depicted in figure 98). A third practice is to employ a signal design that features two controllers, with one controlling the signal displays at signals 1 and 2 and the other controlling signal displays at signals 3 and 4 (with locations as depicted in figure 98). (3) left turns from the main street concurrent with right turns from the side street. These phasing schemes afford greater flexibility to accommodate junctions where there are unbalanced left-turn and/or U-turn volumes. Figure 99. Chart. Signal phasing for a RCUT intersection for one controller with single concurrent pedestrian phase to allow pedestrians to cross the main street. Figure 100. Chart. Signal phasing for a RCUT intersection for one controller in which pedestrians cross the main street at two separated signal-controlled crosswalks. Figure 99 and figure 100 illustrate that pedestrians can cross the minor street approaches during the phases that serve major street through vehicles. Pedestrians can cross the major street approaches during the phases that serve left-turning vehicles. Providing a minimum green time to allow pedestrians to cross both major street legs during a single phase (i.e., a one-stage crossing) is a challenge to implement at some intersections because it can create substantial delays for through volumes. This single-stage crossing would be less likely to generate potentially dangerous crossing actions by pedestrians. A multistage crossing presents additional challenges for visually impaired pedestrians, and the pedestrian facilities need to be designed accordingly. Table 10 and table 11 show the typical signal timing parameters for these two configurations, while figure 101 and figure 102 show the detector numbers and typical placements for these two configurations. Figure 103 shows suggested signal pole and mast arm locations for a RCUT intersection. The presence of a loon creates a challenge in locating the signal pole and mast arm. At the U.S. Route 17 RCUT intersection in Brunswick County, NC, the signal pole was placed upstream of the loon. This means that signal heads for the major street are on the near-side of the crossover, but they likely provide better visibility to the signal for crossover traffic. Figure 104 through figure 107 show that the U.S. Route 17 RCUT intersection operates with pole-mounted signals in the median for the U-turning traffic. A potential disadvantage for signal heads mounted on ped poles in the median is that these pole-mounted signal heads may be visually blocked by queued traffic. Table 10. Typical signal controller settings for signal phasing shown in figure 99. Table 11. Typical signal controller settings for signal phasing shown in figure 100. Figure 101. Illustration. Detector locations for RCUT intersection for the signal phasing in figure 99. Figure 102. Illustration. Detector locations for RCUT intersection for the signal phasing in figure 100. Figure 103. Illustration. Possible signal pole and mast arm locations for RCUT intersection. Figure 104. Photo. Signal pole locations at the main intersection of U.S. Route 17 RCUT intersection in North Carolina. Figure 105. Photo. Signal pole locations at the main intersection of U.S. Route 17 RCUT intersection in North Carolina. Figure 107. Photo. Signal pole locations at the main intersection from the minor street approach. Signing and marking a RCUT intersection is similar to signing and marking an MUT intersection, as described in chapter 3. 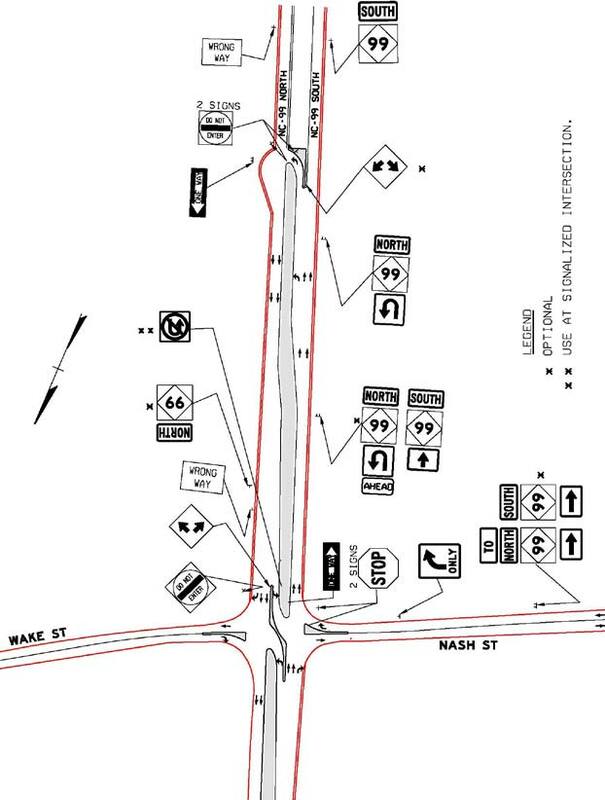 Figure 108 shows a signing and marking plan for a RCUT intersection based largely on MDSHA guidance for one direction of travel, while figure 109 shows signing and marking guidance from NCDOT. 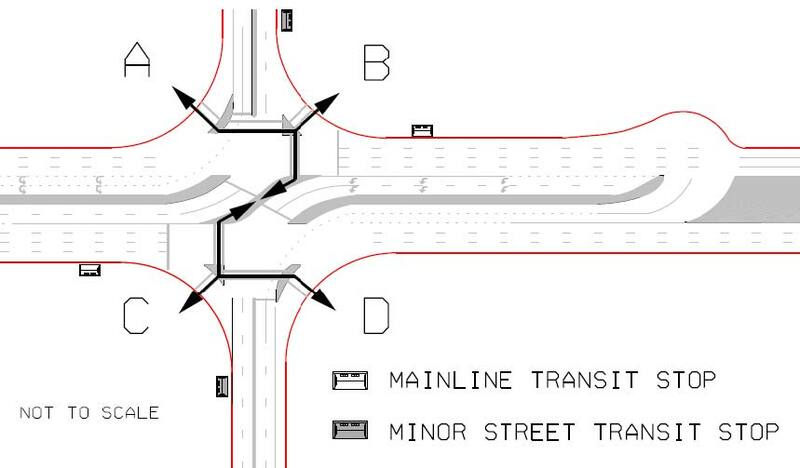 The current MUT intersection and RCUT intersection guidance from the two States indicates there is no need for overhead signing at most RCUT intersections. Figure 110 shows the typical signing and marking used in Maryland’s implementation of unsignalized J-turns. Figure 108. Illustration. RCUT intersection signing plan derived from Maryland practice. Figure 110. Photo. Signing and marking at an unsignalized J-turn in Emmitsburg, MD. As of this report, drivers have adjusted quickly to the three recent RCUT intersection installations in North Carolina. Few wrong way movements through crossovers have been observed at rural intersections. Few red light runners have been observed at crossovers on U.S. Route 17. Overall, traffic seems to flow smoothly. One concern expressed prior to implementation for all three areas was that these were all areas with high concentrations of tourists and retirees who might be surprised or slower to adapt to new traffic patterns. Those concerns have generally subsided. Figure 89 through figure 91 previously showed pedestrian crosswalks for three variations of the RCUT intersection design. Figure 111 shows the typical pedestrian movements at a RCUT intersection. The major street crossing is generally on one diagonal path, which is longer than at a conventional intersection. RCUT intersections allow pedestrians to cross the main street between one but not both pairs of opposing corners. For example, figure 111 shows the crossing between the northeast and southwest quadrants (i.e., between quadrant B and C). Crossing the street diagonally from the other quadrants (i.e., between quadrant A and quadrant D) requires pedestrians to cross three streets: first across a side street (A to B or D to C), then the diagonal crossing of the major street (B to C or the reverse direction), and finally the second side street (C to D or B to A). This movement increases pedestrian exposure to vehicular traffic when compared to a traditional intersection design by requiring pedestrians to cross three legs instead of two as in a traditional intersection. As a result of the additional crossing maneuvers and subsequent crossing time, some pedestrians may attempt to directly cross the major street (i.e., C to A or B to D) or cross from the center diagonal island (E) to one of the alternate quadrants (i.e., A or D). Figure 111. Illustration. Pedestrian movements in a RCUT intersection. Several measures described in the following sections should be considered to mitigate these potentially hazardous pedestrian crossing behaviors. As the typical RCUT intersection design favors pedestrian movements between the northeast (B) and southwest (C) quadrants of an intersection, the best application of the RCUT intersection is in locations where this is the predominant pedestrian crossing. This application is more suited to suburban environments where land uses are separated, and pedestrian traffic is relatively low. If this is the current situation, then future development and future pedestrian traffic need to be considered. It favors predominant traffic on paths A to B and C to D. Urban commercial business district (CBD) environments may not be well suited for this type of RCUT intersection configuration, as land uses in urban areas typically result in pedestrians crossing all four legs of the intersection. Wayfinding signing can help direct pedestrians through the intersection to arrive at their desired destinations. Providing adequate wayfinding signing is important, considering most pedestrians are unfamiliar with the designated crossing patterns of a RCUT intersection design and may attempt to cross streets using traditional patterns. Adequate signing helps reduce pedestrian confusion and may encourage pedestrians to use designated travel paths through the intersection. Barriers should be used to help prevent pedestrians from making undesirable crossings. Barriers should be rigid, especially at higher volume, higher capacity intersections. However, rigid barriers can present a hazard to motorists and would need appropriate end treatments. An alternative breakaway railing system or even plantings may not pose as much as a hazard to drivers (i.e., spearing hazard) and could be an alternative to channelize pedestrians. An example of pedestrian channelization at a RCUT intersection is shown in figure 112. There are several variations to the RCUT intersection design in figure 89 through figure 91 that can enhance the ability of pedestrians to cross the main street. 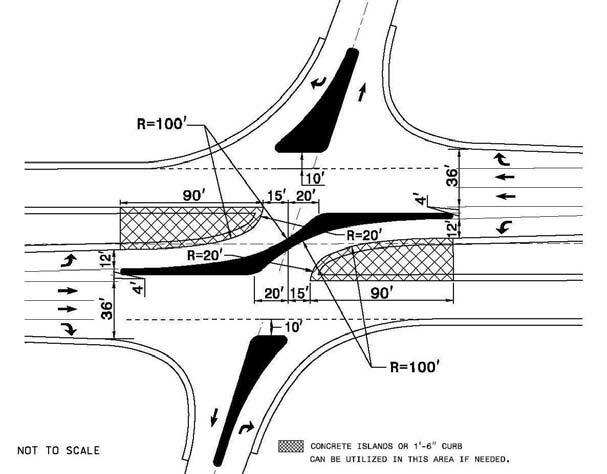 One option is to remove the channelized right-turn islands, as seen in figure 90. Pedestrians are able to cross in one continuous interval. Researchers should consider using common design features that minimize crossing distance (such as smaller radii) and conflicts between pedestrians and vehicles (right turn on red prohibitions) to enhance safety for all pedestrians. Figure 113 shows another variation to the RCUT intersection design that may improve pedestrian access, in which the minor street approaches are offset. This design shortens the path to cross the arterial. The offset makes almost no difference in vehicle operations at most RCUT intersections, but pedestrian crossings would be more direct. A shorter crossing distance would make a one-stage crossing more feasible, decrease pedestrian exposure to the moving vehicles on the main street, and likely increase the percentage of pedestrians choosing to cross at the proper location. Position guidance would be needed to direct pedestrians to the crossing locations and deter them from crossing at other locations. Figure 113. Illustration. RCUT intersection with minor street approaches offset to produce a shorter pedestrian crossing. For the design shown in figure 113, the major street crossing could be made in one or two stages, depending on the signal phasing. A one-stage crossing (i.e., crossing both directions of the major street during one signal phase) is possible if the distance is not too long. Additionally, the necessary green time for that phase should not take too much green time away from the signal phase for major street through traffic signals 1 and 4 in figure 98 and can be controlled by one controller. At many RCUT intersections, these conditions may prove untenable, and a two-stage crossing of the major street should be used. In a two-stage crossing, a pedestrian crosses one direction of the major street during one signal phase and the other direction during a second signal phase, often with some delay between the phases. Because there are only two signal phases at each individual signal-controlled intersection (e.g., at locations 1 through 4 in figure 98) and the cycle lengths are short, the amount of delay to a pedestrian making a two-stage crossing should be relatively small. In the event that relatively light pedestrian crossing volumes exist, the infrequent need for a long red time on the main road to accommodate the crossing demand would suggest that a single-stage crossing may be acceptable. Pedestrians crossing at a RCUT intersection can encounter fewer conflicting traffic streams than at a typical conventional intersection. Conflicts at conventional intersections are possible between left-turning traffic from the side road and pedestrians crossing the main street. If signal-control is present, then the conflict may still exist when there is no left-turn signal phasing for the side road or when there is protected-permitted left-turn phasing for the side road. By comparison, pedestrians at a RCUT intersection cross the main street diagonally during signal phases where there are no conflicts possible. The pedestrians crossing at a RCUT intersection may be generally slower and less direct, but fewer conflicts are expected. As described in section 4.4, the RCUT intersection affords designers the flexibility to install traffic signal control without adversely affecting the progression capabilities (e.g., without adding much delay) for major street through traffic. This flexibility is put to use by installing pedestrian signals at U-turn crossovers or midblock locations. At U-turn crossovers, one signal is likely to be already in place, so the additional cost is for another set of traffic signals to control the second direction of the major street. Pedestrian signals at U-turn crossovers or midblock locations allow pedestrians to safely cross the major road. RCUT intersections accommodate both bicyclists and pedestrians through the use of a shared-use path that provides refuge in the median. 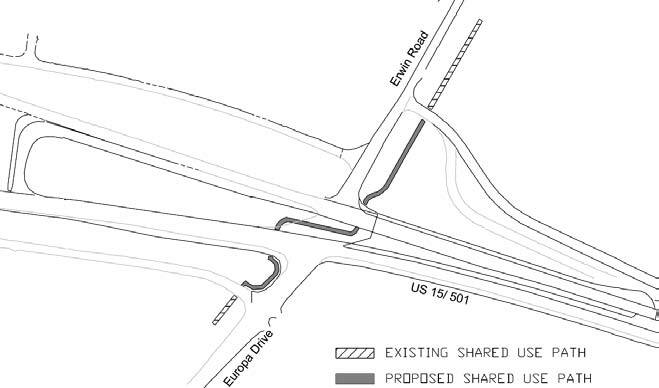 Figure 112 shows the plan view of the shared-use path designed by NCDOT through the median of the RCUT intersection under construction on U.S. Route 15/501 in Chapel Hill, NC. The crosswalks are perpendicular to travel lanes, which aid pedestrians with vision impairments. The shared-use path in the median has a reverse curve design. NCDOT has designed a 10-ft-wide path with 2-ft-wide shoulders through the otherwise grassy median. Bollards are placed near the shared-use path entrances to discourage motor vehicle use. Accessible curb ramps with detectable warnings are constructed at all transitions from the sidewalk to the street. Design guidelines for shared-use paths for individual jurisdictions should be referenced for specific recommendations on geometric elements of the path. Bicyclists along the main road appreciate the high green time percentage for the major-street through movement at RCUT intersections. Bicyclists desiring to make a left turn or through movement from the side street face a choice of using the pathway through the median designed for pedestrians or using the U-turn crossovers in a manner similar to drivers of motor vehicles. Their choice may depend on the type of bicyclist they are, as commuter bicyclists are likely to prefer to travel in the roadway while novice bicyclists may prefer the multipurpose trails. The U-turn may present a hazard to bicyclists. Vehicles executing U-turns have more difficulty staying in lanes, and larger vehicles exhibit greater off-tracking, which may cause vehicles to encroach into bicycle lanes. Therefore, RCUT intersections should offer alternate paths for bicyclists, such as the pathway through the median. 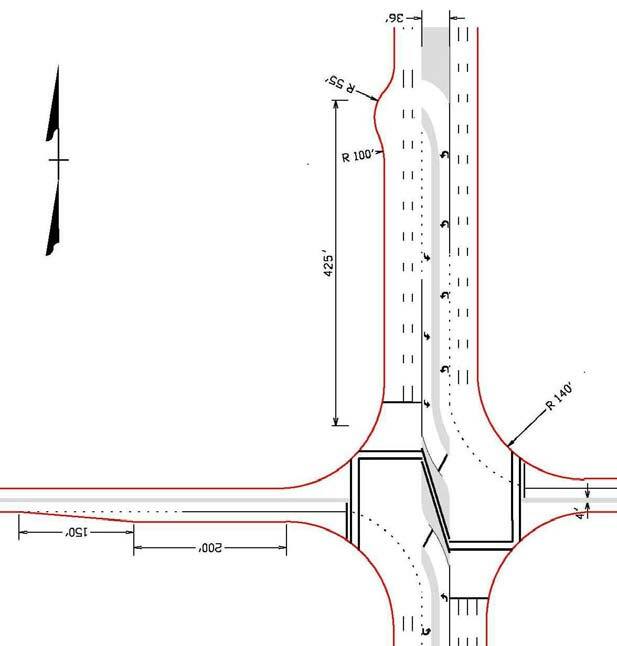 This type of design is better suited for areas where separated paths for bicyclists are more prevalent than on-street bicycle lanes, reinforcing that the RCUT intersection design is better suited in suburban areas. Appropriate signing is needed to direct bicycles to the pathway through the median, and the pathway should be designed for shared use similar to the design described earlier for Chapel Hill, NC. This is similar to the bicyclist treatments at multiline roundabouts. With respect to transit users at RCUT intersections, bus routes along the arterial are enhanced with operation that is likely more efficient and results in fewer conflicts for transit users. Bus stops work well on the far side of the minor street where they are out of the way of more turning traffic. Bus stops in the loon should be strongly discouraged to keep it free for turning vehicles. Buses making left turns or proceeding through from the minor street need to travel additional distance and incur more travel time compared to traversing a conventional intersection. U-turn crossovers designed to accommodate large combination trucks without curb encroachments should be able to accommodate standard transit and school buses. Figure 114 shows that transit stops can be located in conjunction with the pedestrian movements discussed earlier in the section. When transit routes run along the main street, locating transit stops on the near side of the intersection is preferred so that it favors the heavy pedestrian movement (i.e., from B to C or from C to B). When transit routes run along the minor street, locating transit stops on the far side of the intersection is preferred. For a bus turning left from the main road, the stop should be located on the minor road so that buses do not have to weave from the right lane into a left lane to use the U-turn. In each case, pedestrians on the remaining quadrants have to take circuitous routes (i.e., from A to D or from D to A, as shown in figure 111). Figure 114. Illustration. Transit stop locations at a RCUT intersection. RCUT intersections operate better than conventional intersections under certain volume conditions. This section contains a review of previous research on RCUT intersection operations as well as the results of simulation experiments performed for this report. Kim et al. compared three RCUT design cases to conventional intersection design. (60) Two of the RCUT design cases featured one U-turn lane. The other RCUT design case featured two U-turn lanes. For each of the three cases, several entering volume scenarios were analyzed to determine the effect on travel time and vehicle throughput. The results showed that the performance of a RCUT design was better than that of a conventional intersection design, primarily for the one U-turn lane design and at high volumes. 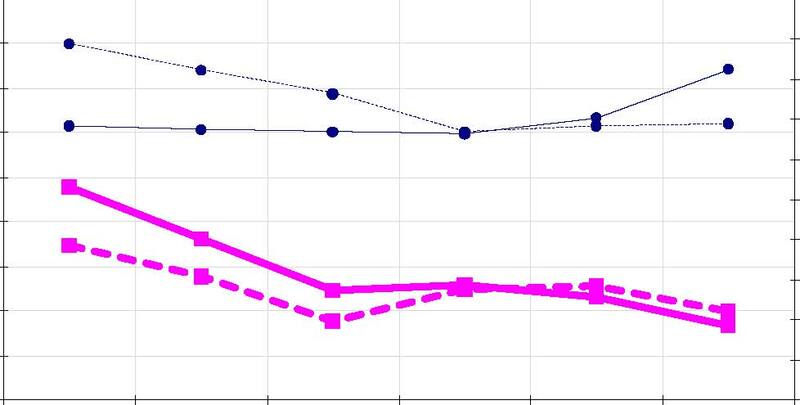 Travel time was reduced by 30 to 40 percent, while throughput increased 22 to 40 percent. The highest vehicle throughput for the one U-turn lane design was achieved when green time on the minor road was 20 percent of the green time on the major road. In comparison, the RCUT design with two U-turn lanes experienced a smaller increase in vehicle throughput, ranging from 9 to 12 percent. A study of a Michigan corridor comparing TWLTLs to MUT crossovers also investigated RCUT median crossovers. (20) The comparison results are shown in table 12. During peak conditions, travel time on the corridor with RCUT crossovers decreased 10 percent. In addition, travel speed was 15 percent higher than the same conditions using TWLTL. During off peak conditions, the study revealed that RCUT crossovers produced operational differences that were similar to TWLTLs. Table 12. RCUT intersection simulation results. VISSIM ® was used to gain further insight into the operational performance of RCUT intersections in comparison to conventional intersections. Five intersection geometric design cases of RCUT intersections and conventional intersections were simulated. Table 13 shows the geometric design configurations of the cases simulated. The lane configurations and geometric features on both approaches of the major road were identical. Similarly, the lane configurations and geometric features on both approaches of the minor road were identical. Table 13. Geometric design configuration for VISSIM ® simulations. A total of 450-ft distances from the main intersection to U-turn crossovers. Study network including 0.5 mi in each direction from the main intersection. Single right-turn bays on the mainline. Right-turn on red allowed at each signal. No left-turn on red allowed. A signal at each left-turn or U-turn crossover. A 40-ft median width on mainline. Loons sized as needed to accommodate a U-turning WB-50 truck. A 45 mi/h desired speed on mainline. A 25 mi/h desired speed on side street. Saturation headway of approx 1,900 veh/h/lane. Table 14. Volumes for geometric design configurations for VISSIM ® simulations. * A constant right-turn volume of 300 has been used and is excluded from the major road volumes shown. ** Both minor road approaches have the same volumes. Figure 115 through figure 119 show the comparison of throughput and network travel time for the five geometric design cases (see table 13) of RCUT and conventional intersections. At lower minor road volumes, simulation results showed that the RCUT intersections had the highest overall capacities for all the geometric design cases. Simulation results indicated that the throughput for RCUT intersections was 15 to 30 percent higher than comparable conventional intersections for the high-volume scenarios when the MRTV/TIV ratio was in the range of 0.1 to 0.2. The throughput of the RCUT intersection became similar to the conventional intersection when the MRTV/TIV ratio was in the range of 0.18 to 0.25. Beyond the MRTV/TIV ratio of 0.25, the conventional intersections had 5 to 17 percent higher capacities than RCUT intersections. Simulation results indicated a 25 to 40 percent reduction in network travel time for RCUT intersections in comparison to conventional intersections for the high-volume scenarios when the MRTV/TIV ratio was in the range of 0.10 to 0.15. The network travel times for the RCUT intersections became similar to the conventional intersections when the MRTV/TIV ratio was in the range of 0.18 to 0.25. Beyond the MRTV/TIV ratio of 0.25, the network travel time for the RCUT intersections increased from 15 to 25 percent in comparison to the network travel time for conventional intersections. For the same set of simulations, VISSIM ® simulation results indicated a very similar trend in the medium-and low-volume scenarios. Simulation results indicated that the difference in travel time between the RCUT and conventional intersections was a function of the MRTV/TIV ratio and was also sensitive to the relative proportion of the sum of left-turning and through vehicles on the minor road in comparison to the total minor road volume. Figure 115. Graph. Throughput and travel time comparisons for geometric design case 1. Figure 116. Graph. 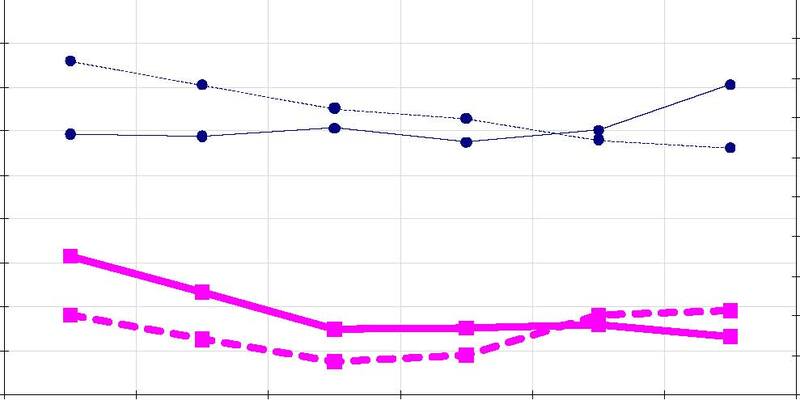 Throughput and travel time comparisons for geometric design case 2. Figure 117. Graph. Throughput and travel time comparisons for geometric design case 3. Figure 118. Graph. Throughput and travel time comparisons for geometric design case 4. Figure 119. Graph. Throughput and travel time comparisons for geometric design case 5. VISSIM ® simulations with pedestrian presence on all legs during every signal cycle were modeled to quantify the impacts of heavy pedestrian presence at the modeled intersections. The presence of pedestrians caused no major changes in operational performance for the high-volume scenarios for RCUT and conventional intersections because the phases were long enough to accommodate the pedestrian phases. However, in the medium-volume scenarios, the presence of pedestrians resulted in an additional average intersection delay of 7 and 12 percent for RCUT and conventional intersections, respectively. In the low-volume scenarios, the presence of pedestrians caused an additional average intersection delay of 10 and 15 percent for RCUT and conventional intersections, respectively. From the simulation results, the RCUT intersections accommodated pedestrians better in the low-and medium-volume scenarios because of having just two signal phases per cycle, compared to a conventional intersection that may have three or more signal phases per cycle. In conclusion, RCUT intersections were expected to operate better than conventional intersections in cases where the major road left turns were high, and the average major road left-turn volume per lane was close to 80 percent or more of the average minor road traffic volume per lane. The RCUT intersections typically had higher throughputs than conventional intersections when the MRTV/TIV ratio was lower than 0.25. A number of documented safety studies suggest that RCUT intersections offer significant safety advantages over conventional arterials for specific situations. In addition, research in North Carolina found very few collisions caused by U-turns on main streets with medians. (62) The best evidence was from Michigan, where studies have shown lower collision rates on Michigan’s signalized arterials for MUT intersections, which are similar to the U-turn treatment at RCUT intersections, as compared to conventional designs. Figure 120 shows the conflict points at a RCUT intersection. Figure 120. Illustration. Conflict diagram for RCUT intersection. Safety data were obtained for the unsignalized U.S. Route 23/74 site in North Carolina, which was opened in 2000, but the other two North Carolina sites were too new for crash data to be available for this report. (63) Table 15 summarizes the results of an NCDOT before and after study of crash rates in the U.S. Route 23/74 corridor. (63) While the property damage only collision-reporting threshold increased during the study period, it appears that the RCUT intersection installation has likely not been harmful and has probably even been helpful. Annual collision frequency has been consistent since the RCUT intersection completion in 2001. Table 15 shows that left-turn and angle collision frequencies, which are the crash types most susceptible to correction with a RCUT intersection, have been lower since installation. Fatal collision frequency has also been consistent across those years since 2001, and injury collision frequency has been somewhat lower. There has been a reduction in crash averages and average rates in the after period. The frequency of other collisions has risen since RCUT intersection installation, while the annual frequencies of rear-end, run-off-road, and right-turn collisions have generally remained unchanged since construction of the RCUT intersection. Table 15. Annual average collision rates before and after 6 years at the unsignalized RCUT intersection of U.S. Route 23/74 in North Carolina. Three intersections on the U.S. Route 17 corridor were converted to RCUT as shown in figure 121. Each of the intersections (B, D, and F) is operated under signal control. The crossover junctions are designated by circle A, C, E, and G. Since these intersections were built as part of the redevelopment along the area, the traffic patterns changed significantly in the after conditions. 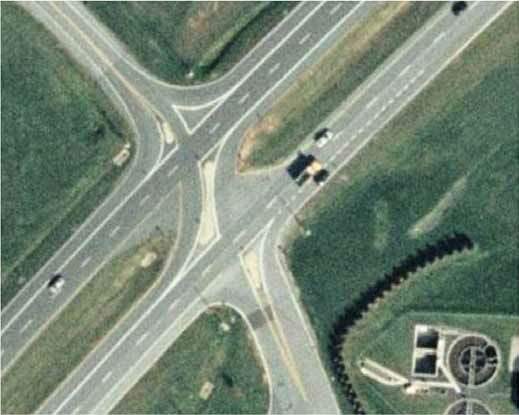 Hence, a before versus after crash comparison was not conducted for these intersections. The comparison of the after crash performance at the three intersections to intersections with comparable average daily traffic in Charlotte, NC, and intersection crash performance predictions based on the AASHTO’s Highway Safety Manual (HSM) equations (to be published later in 2010) are shown in table 16. Figure 121. Photo. RCUT treatment at three intersections on U.S. Route 17 in Leland, NC. Table 16. Annual average collision rates comparison based on HSM. Note: HSM will be published later in 2010 and will be available online: http://www.highwaysafetymanual.org. Table 16 compares the after collision rates of the three RCUT intersection treatments on U.S. Route 17 with average collision rates obtained from 25 intersections having similar ADTs in the Charlotte area. In addition, comparison is completed with collision rates obtained from the model prescribed for four-legged signalized intersections from chapter 12 of the HSM. Similarly, table 17 compares the after collision frequencies of the RCUT intersections. It can be observed that the total after crash rates for all three RCUT treatments were below the crash rates predicted for a four-legged conventional intersection having similar ADTs by HSM and also for lower than the 10-year average crash rates obtained from 25 conventional intersections having similar ADTs in the Charlotte, NC, area. Crash rates for fatal and injury crashes for the 25 intersections in Charlotte, NC, were not available. The crash rates for fatal and injury crashes at the intersection at Grandiflora was slightly higher than what was predicted for a conventional intersection by the HSM. A similar trend was observed in the collision frequencies shown in table 16. Table 17. Annual average collision frequency comparison based on HSM. As of 2007, there were four RCUT intersections on U.S. Route 301. All four are at unsignalized intersections on rural sections of U.S. Route 301 on the Eastern Shore. U.S. Route 301 is a four-lane divided highway with a posted speed limit of 55 mi/h and partial access control that serves as an important through route between the Baltimore, MD, and Washington, DC, areas and Delaware. The minor streets are undivided two-lane roads with low volumes. The MDSHA installed the RCUT intersections as safety countermeasures where intersection-related collisions were occurring. Consequently, regression to the mean is a possible bias to the results shown below since the crashes may have been reduced in subsequent years even without treatment. 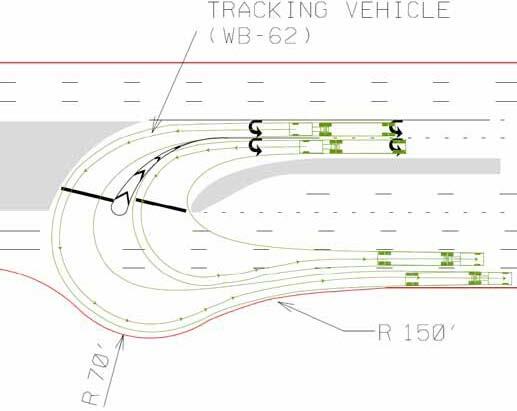 Two of those RCUT intersections have been in place long enough for collision data to show trends related to the installation of the intersection designs. Table 18 shows the relevant collision data for the intersection of U.S. Route 301 and MD 313 near Galena in Kent County, which was installed in 2001. The table summarizes the annual average crashes separated by severity and type and the total crashes, both in the before and after periods. The reduction in collisions was dramatic from an average of eight collisions per year from 1997 to 2000 to only two collisions from 2004 to 2006. There were 22 injury collisions from 1997 to 2000, while there were none from 2004 to 2006. There were 22 angle collisions from 1997 to 2000, whereas there have been none from 2004 to 2006. Other collision types from 1997 to 2000 included six opposite-direction collisions, two fixed-object collisions, and three other collisions. The two collisions in 2004 were a rear-end collision and another collision. Table 18 includes only collisions reported to be within 250 ft of the main intersection. There were no reported collisions at the U-turn crossovers during the after period. The available data translates into a 90 percent reduction in total collisions and the total crash rate at the main intersection. Table 18. Annual average collision rates before 4 years and after 5 years at unsignalized RCUT intersections on U.S. Route 301 and MD 313 in Maryland. Table 19 shows the relevant collision data for the intersection of U.S. Route 301 and MD 456 near Queenstown in Queen Anne’s County, which was installed in 2005. The table summarizes the annual average crashes separated by severity and type and the total crashes, both in the before and after periods. Table 19. Annual averages collision rates before 8 years and after 1 year at the unsignalized intersection of U.S. Route 301 and MD 456 in Maryland. The reduction in collisions was also significant at this intersection, from an average of four collisions per year from 1997 to 2004 to only one collision from 2005 to 2006. There were 19 injury collisions from 1997 to 2004, while there were none from 2005 to 2006. During 1997 to 2004, there were 23 angle collisions, whereas there was 1 from 2005 to 2006. Other collision types from 1997 to 2004 included two opposite-direction collisions, four rear-end collisions, one fixed-object collision, and two other collisions. Although sufficient after data were not available to perform an appropriate evaluation, the reduction in crash experience for the first year post-construction at MD 313 indicates an improvement in safety. With no reported collisions at the U-turn crossovers and the main intersection, there has been a reduction in crash averages and average rates in the after period. Based on cost data available at the time of this report, construction costs for RCUT intersections are likely to be higher than the costs for comparable conventional intersections. To construct a RCUT intersection on U.S. Route 15/501 in Chapel Hill, NC, the total bid price was just under $5 million for a project that was 0.392 mi long. The project involved widening an existing four-lane divided highway on the outside to six lanes, adding U-turn crossovers in a configuration like that shown previously figure 82, adding four interconnected signal controllers, and relocating a frontage road away from the main intersection. The work was to be done in the midst of high-traffic loads, and some work was to be performed at night. The traffic sign costs were higher than expected, partially as a result of the design calling for two overhead sign structures totaling over $150,000 to provide guidance to motorists prior to the U-turn crossovers. In a developing suburban area southwest of Wilmington, NC, a developer recently funded a project converting a four-lane divided arterial with several unsignalized two-way crossings into a super street corridor with RCUT intersections. The project was about 0.6 mi long and included three signalized RCUT intersections with left-turn and U-turn crossovers. The construction costs were about $2 million in 2006. 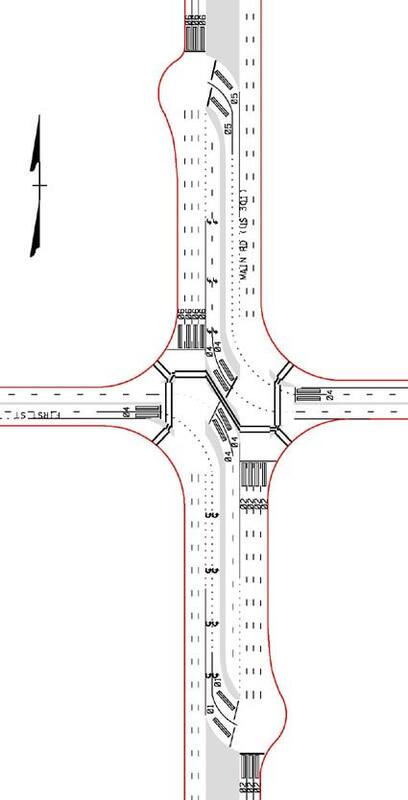 While a comparable conventional intersection was not designed, engineers familiar with the site estimated that the RCUT intersection cost was about double what it would have cost to construct three conventional intersections. Even more than in the U.S. Route 15/501 case described previously, higher costs for traffic signal control were thought to be much of the reason for the higher cost in this case. Conventional intersection improvements using additional lanes, signals, and signal phases. A super street corridor with RCUT intersections. Conversion of the arterial into a freeway with 17 interchanges. Conceptual designs were completed that would bring the 2030 intersection levels of service along the entire corridor to a LOS D or better, and costs were estimated for those designs using 2005 NCDOT average unit costs. The study estimated that the conventional alternative cost at $75 million, the conversion to a super street corridor with RCUT intersections cost at a projected $100 million, and the freeway alternative cost at $254 million. The final case for which data were available in North Carolina was U.S. Route 1 in Lee and Moore Counties, a rural area in the rolling terrain of the central part of the State. The U.S. Route 1 RCUT intersection corridor included five sets of unsignalized left turn and U-turn crossovers spread over a 12-mi length of four-lane arterial. The construction on new alignment was completed early in 2006. NCDOT was late in the construction phase of a conventional arterial before converting the intersections into RCUT intersections. The reasons for the conversion were to enhance safety and to preserve mobility without signals in the corridor. NCDOT had already been receiving requests to install signals at some of the intersections. On the Eastern Shore of Maryland, the intersection of U.S. Route 301 and MD 313 in Kent County was retrofitted to a RCUT intersection treatment, alternatively referred to as the J-turn treatment in Maryland. The predominant reason was to reduce crashes resulting from a lack of acceptable gaps in the main street that allowed vehicles to safety turn to and from the side street approaches. The total intersection improvements were completed in November 2005 at an approximate cost of $618,000. (65) Costs for modifying the intersection while keeping a conventional design were not discussed in the study. The ideal comparison of costs and benefits would consist of final construction plans for conventional intersection improvements, RCUT intersection, and grade-separated interchanges combined with an evaluation of operational capacity and safety record. The ability to construct the improvements with the least impact on traffic would also be an important consideration in the decisionmaking process. Lacking detailed construction plans, a basic cost comparison of conventional and RCUT intersections was provided for discussion purposes. 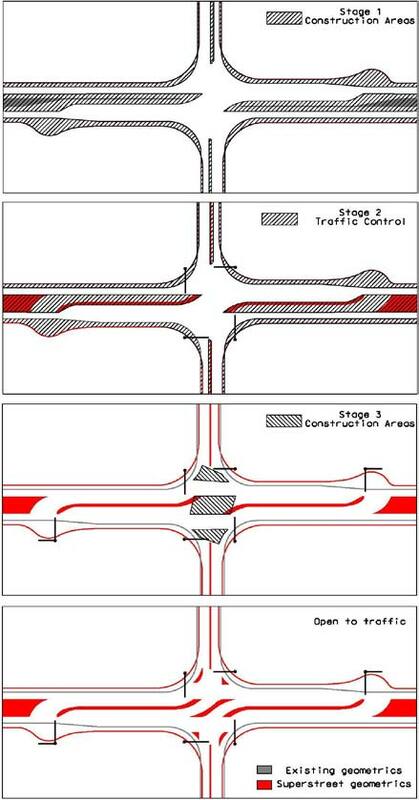 For cost-comparison, four kinds of conventional intersections were assumed as alternatives to the RCUT intersection treatment. The first was a conventional intersection with wide median and side streets having two through lanes. The second was with wide median and side streets having one through lane. The third was with a narrow median and side streets with two through lanes. The fourth was with a narrow median and side streets having one through lane. These are shown in figure 122. Figure 122. Illustration. 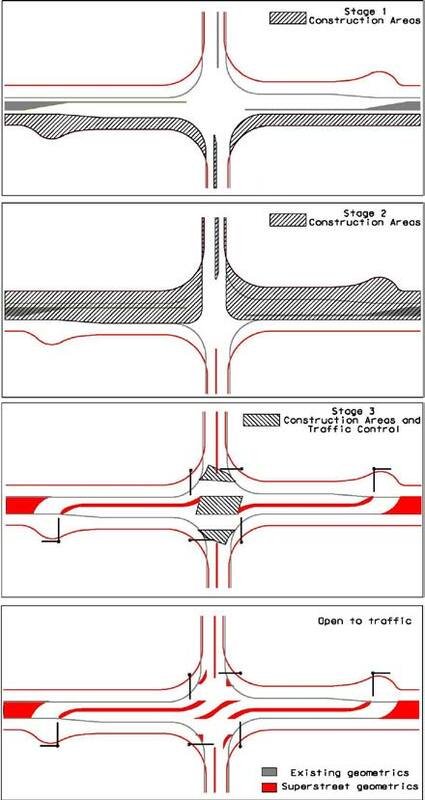 Alternatives of conventional intersections used for cost comparison. As shown in table 20, the cost to construct a conventional intersection with wide medians is closer to the cost to construct a RCUT intersection treatment. Table 21 shows similar construction cost estimates for RCUT intersections with mainline left-turn lanes and U-turn crossover back to back as shown previously in figure 91. Footprint comparisons provided in figure 123 suggest that the RCUT intersection requires additional right-of-way to varying degrees. The cost of right-of-way may vary substantially from $10 to $100 per square foot and may be a major determinant. Average land prices in Virginia are $10 per square foot in the rural areas and $85 per square foot in urban areas. With such wide variation, the cost estimates do not include right-of-way acquisition. Four signal mast arms are needed at the main intersections of RCUT intersections, similar to conventional intersections. Additionally, dual mast arms are provided at each crossover. Consequently, for the cost calculation, the RCUT intersection signal equipment is estimated to cost twice as much. To this point, construction costs are generally higher for a RCUT intersection than a comparable conventional intersection. The differences in cost are likely to decrease over time for several reasons. First, agencies and designers can take advantage of lessons learned from earlier installations to further optimize benefits and costs. Second, agencies can learn to reduce the cost of signals, perhaps using the one controller plans, which were discussed in section 4.4. Using two controllers at an intersection seem to promise cost savings over four controllers without compromising progression capabilities. Finally, cost savings in signing are possible as drivers learn how RCUT intersections operate and therefore need less guidance. Table 20. New intersection construction cost estimates for signalized RCUT intersection. Wide Median and 2 Thru Lanes Side St. Wide Median and 1 Thru Lane Side St. Narrow Median and 2 Thru Lanes Side St. Narrow Median and 1 Thru Lane Side St.
Table 21. New construction cost estimates for signalized RCUT intersection with back-to-back left-turn and crossover. a. Footprint comparison of a RCUT versus conventional intersection with wide median and dual through side street. b. Footprint comparison of a RCUT versus conventional intersection with wide median and single through side street. c. Footprint comparison of a RCUT versus a conventional intersection with narrow median and two through lanes for side street. d. Footprint comparison of a RCUT versus conventional intersection with narrow median and single through side street. 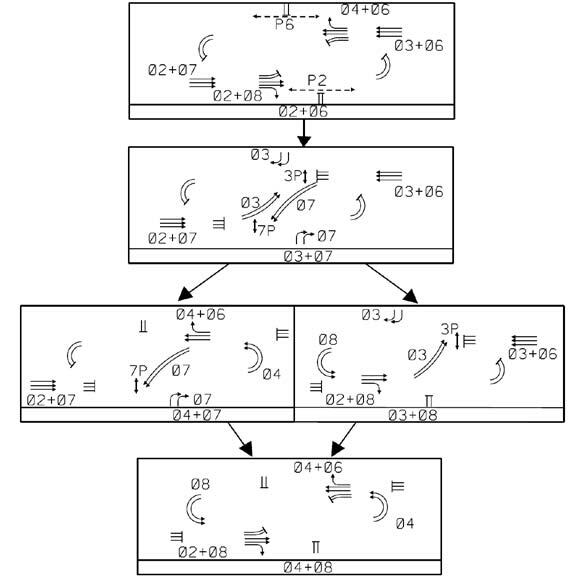 Figure 123. Illustration. Footprint comparisons of a RCUT versus conventional intersection. One of the perceived challenges is retrofitting an existing at-grade conventional intersection into a RCUT intersection while maintaining traffic flow. This section presents ideas on how construction sequencing can be handled. Build the lanes that carry one direction of travel on the arterial on new alignment. This is illustrated in stage 1 of figure 124 with the new lanes being built for the eastbound directional travel. Shift the existing two lanes of traffic flow to those new lanes when they are ready to handle traffic. The intersection is shifted as well and continues to operate conventionally. This is illustrated in stage 2 of figure 124. Begin building the lanes that serve the oppositve direction of the arterial, the U-turn crossovers, and the portions of the left-turn crossovers that do not overlap the existing minor street. This step is also illustrated in stage 2 of figure 124. Shift westbound traffic onto those lanes serving the opposite direction of travel and the U-turn crossovers, allow eastbound traffic to use all of their lanes, shift all minor street through traffic and turning traffic to the U-turn crossovers, and close the existing intersection to through movements from the side street when the lanes are complete. Finish the left-turn crossovers with the center of the intersection vacated, as illustrated in stage 3 of figure 124. Shift traffic to the permanent RCUT intersection configuration, following completion of the left-turn crossovers as illustrated in the ultimate configuration as shown in the bottom graphic of figure 124. 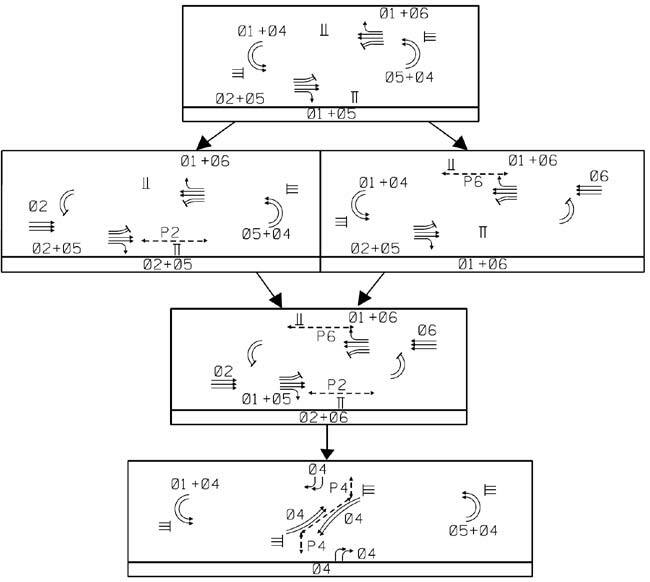 Figure 124. Illustration. Construction staging for converting two-lane road to multilane RCUT intersection. Begin constructing the U-turn crossovers and the portions of the left-turn crossovers that do not overlap the existing minor street. Shift all minor street through traffic and turning traffic to the U-turn crossovers and close the conventional intersection when the U-turn crossovers are completed. Complete construction of the left-turn crossovers with the center of the intersection vacated. Shift traffic to the permanent RCUT intersection configuration following completion of the left-turn crossovers. Figure 125. Illustration. Construction staging for converting a conventional intersection to a RCUT intersection. 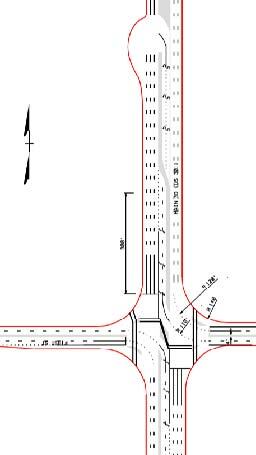 Agencies contemplating RCUT intersection installation should consider additional factors to those discussed in previous sections. These factors include maintenance costs, enforcement needs, left turn on red policies, and emergency vehicle needs. Enforcement needs at RCUT intersections may be higher in the short term but lower in the long term. The custom in Michigan upon opening a new MUT intersection is to allocate extra enforcement resources during the first few weeks of operation. Such an enforcement program is desirable for RCUT intersections. A few wrong-way movements through crossovers and running red light events at crossovers were observed on the new RCUT installations in North Carolina. Enforcement during the periods after the RCUT intersections are initially opened to traffic help drivers become familiar and help reduce unintentional illegal maneuvers. After volumes build and habits form, the need for extra enforcement is likely to subside, and normal vigilance in enforcing traffic laws at RCUT intersections should suffice. In the long term, the ability of a RCUT intersection to allow a wide range of progression speeds and large progression bands may mean that speed is more self-enforcing on super street corridors than on conventional arterials. On a super street corridor of any length, with the good progression that designers expect, drivers quickly realize that it is in their best interest to cruise along with the platoon at the progression speed. As long as drivers comply with traffic signals in these conditions, speed limit compliance should be high. This may allow reallocation of enforcement resources from speed enforcement at RCUT intersections to other duties. As chapter 3 also described, something to consider is allowing crossovers where U-turns exist at the same time as right turns from a side street or driveway and the potential for conflict exists. Prohibiting driveways or side streets at crossover locations is one feasible option. Separate signal phases for the U-turn and the right-turn movements are another option, but that would likely add delay. To manage the conflicts, some agencies use signs (R10-16 in the MUTCD) to direct the U-turn movement to yield to the right-turn movement. (8) Some agencies also use a sign with a legend that reads “Right Turn on Red Must Yield to U-turn” if their laws assign the right-of-way preference to the U-turn movement in this situation. Emergency vehicles may be affected by implementation of RCUT intersections. Emergency vehicles moving along arterials are likely be aided by the design resulting from the higher percentage of green time for the through movement, shorter queues, and fewer conflicting traffic streams. Emergency vehicles turning left from the arterial should not be affected with a design that has left turns on the mainline (see figure 82). However, emergency vehicles turning left from the arterial need to travel longer distances and likely have longer response times with the design shown in figure 83, which does not have left turns on the mainline. Emergency vehicles responding to calls should not often have to make a through movement or left-turn movement from minor streets at RCUT intersections. Should this be necessary, the emergency vehicle is rerouted and has to travel extra distance and spend extra time. Agencies could design a set of left-turn crossovers at an intersection in a rural area with negligible pedestrian crossing demand with low mountable islands to be traversal by emergency vehicles. Recognizing this design feature could tempt drivers of SUVs, pick-up trucks, and other vehicles into executing illegal crossing maneuvers. At a location where frequent left turns or through movements by emergency vehicles from a driveway or side street are expected, a RCUT intersection would not be the most appropriate solution. 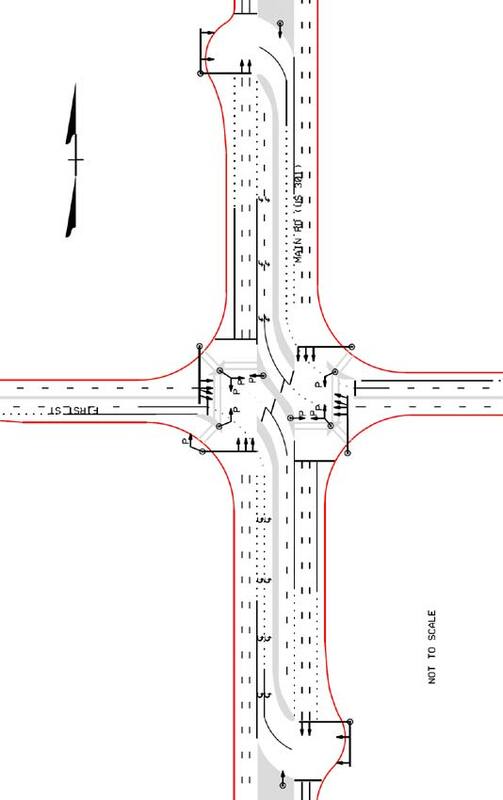 As with all the designs described in this report, the RCUT intersection design is applicable under certain conditions but not appropriate for all conditions. A primary reason to choose the RCUT intersection instead of a conventional design is the ability to process higher volumes on the major road, especially left-turn volumes and through volumes. As mentioned earlier, the RCUT intersection is typically implemented as part of a corridor treatment. Candidate corridors for this design are high-speed divided highways with intersections that have heavy major road through and left-turn demands and low to moderate minor street left-turn and through movement demands. Second, designers can choose the RCUT intersection as a safety measure or collision countermeasure. There are good theoretical reasons to expect intersection collisions to decrease with this intersection design (e.g., fewer vehicle conflicts, particularly of the crossing type). If there are heavy through volumes and left-turn volumes on major road approaches. If the ratio of the minor road approach volume to the total intersection approach volume is less than 0.20. If the mainline left-turning volume/lane is greater than 80 percent of the minor road traffic/lane that would move concurrently during the same signal phase. If the intersection is heavily congested with many signal phase failures for through and left-turn traffic on major road. A RCUT intersection without loons designed to accommodate turns by large trucks typically needs 40-to 70-ft-wide medians as opposed to the 28-ft-wide minimum median width for a conventional intersection with dual left-turn lanes. This extra right-of-way is likely to be costly and may be unavailable at any reasonable price in a densely developed urban area. Loons can be used at the median crossover openings where medians widths are inadequate. A RCUT intersection is a unique intersection design. It has several advantages over a conventional intersection. Applications in Maryland and North Carolina show this design is promising for improving operations and safety in certain situations. The major advantages provided by a RCUT intersection are greater vehicle efficiency for the through movement on an arterial in a signalized corridor and reduced opportunity for crashes compared to conventional designs. A RCUT intersection provides two-phase signals, short cycles, and the chance for good progression in both directions of the arterial at any speed and signal spacing. Better service to through travelers on the major arterial is the main reason to select a RCUT intersection in an urban or suburban area. Fewer conflict points mean that many RCUT intersections are safer than their conventional counterparts. RCUT intersections reroute minor street left-turn and through movements. If the demand for those movements is high, RCUT intersections may not be the optimum design choice. The RCUT intersection requires wider right-of-ways, either in selected locations to accommodate loons or along the corridor for wider medians. RCUT intersections have initial higher construction costs than comparable conventional intersections and may have higher maintenance costs as well. RCUT intersections also create longer crossing distances that require additional pedestrian crossing time, contributing to possible safety concerns.